What started out like any other Willow Tree tasting event at a Virginia Costco turned out to be the opportunity of a lifetime. Customers were enjoying their free samples, when one in particular explained that she was an event organizer for the annual White House Easter Egg Roll. She was very interested in serving Willow Tree chicken salad to event staffers and volunteers. 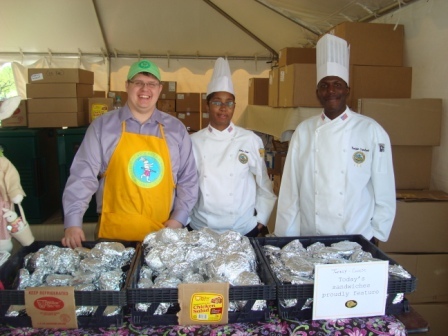 Fast forward through a few logistics, such as security checks and chicken salad sandwich preparation, and Willow Tree president Wally Cekala and his family found themselves on the White House lawn on Easter Monday. We asked Wally to expand on some of the details about this great day in Willow Tree history. What were your thoughts leading up the event itself? Well, to be honest, I took it with a grain of salt at first until I received the email confirming that it was really going to happen! My son Chris was on the road show in Virginia. Due to security requirements, and a little time pressure, he was immediately put through a security check and approved to be an on-site vendor. Then the order was placed for both our regular chicken salad as well as our new cranberry walnut variety. I like getting feedback on our latest chicken salad, but I sure didn’t expect it to happen on the White House grounds! While Chris was going to be the only person from the company working the event, my family and I were invited as guests. They thought it was just surreal. What did Chris do to prepare? Chris had to get through security at six in the morning. He worked with two chefs to make chicken salad sandwiches with bread from a local bakery. After almost four hours of preparation, the gates opened. You can imagine how many staffers and volunteers it takes to manage an outdoor event for over thirty thousand people, never mind the White House security requirements. That’s why event organizers look for really good food to serve the crew that works at the event all day. We were happy to be one of the vendors chosen. 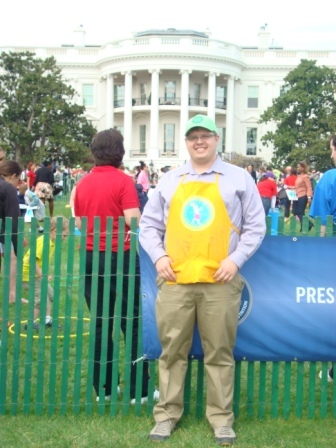 What was it like to be one of the thousands of families invited to the White House as guests? The White House Easter Egg Roll tradition goes back over 130 years. Everyone was so excited to be there. There are lots of musical artists, and it really is an awesome event. I think that everyone on that lawn felt like “Mr. Smith goes to Washington.” I can’t say enough about the people who run it and the Secret Service. They are very nice to the public. Between all of the families, the music, and the entertainment, it almost felt like Disney! There were so many people that guests enter in groups, staggered over time. It really was just amazing. We really felt lucky to be there, and we’d do it again if we could. For my family, one of the best parts couldn’t have been planned. As we were leaving, one of the staffers asked us if we tried the chicken salad! He said he loved it! If you’d like to learn more about the annual White House Easter Egg Roll, click here. The cranberry walnut chicken salad mentioned in this article is now available at the Willow Tree Retail Store in Attleboro, MA. For directions and hours, click here.